2 The Kenzo Tiger T-shirt. Though you see the "Kenzo Eye" more often, I still think this tiger shirt is a musthave. On the photo you see a white shirt, but I prefer the green version you can find here for 85€. 3 Pink shoes! These lovely shoes are designed by Senso, a brand that I love more and more. Just like Ganni. The prices are high but these pink heels you can find now in sale for 64,95€. 4 Vintage levi's shorts. Definitely a musthave for summer. I still didn't find a right fitting but maybe this one is the right one? You can buy it at asos for 56€.Let me know if you ordered this one already! 8 And yes, the Ray Ban clubmaster. I think these sunglasses are just as nice as the Wayfarer. But this design can give your outfit a more vintage/classy look. So of course, also a musthave:) Find it here for 107,95€. 9 J' taime, also by Ganni. I'm not a big fan of text on clothing, but this kind of texts I love! You can buy it here for 89,95€. Wat een mooie items allemaal! Die roze boots zijn zo gaaf!!! 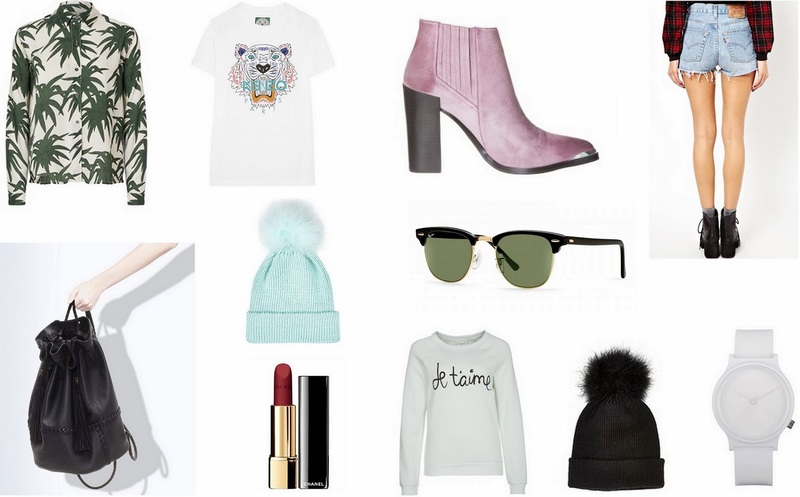 Oh wat een mooie items staan ertussen. De Levi's shorts, wauw!! En de Chanel lippenstift... En het Kenzo T-shirt.... Enzovoort haha, allemaal leuke dingen! Die 'Je T'aime' sweater en zonnebril is echt super! these are such awesome picks! love love love them!